Where Are the MagSafe Adapters for Cars and Airplanes? A Lamborghini on Every Desk? Now that Apple took my advice and killed the term PowerBook, what will the Ultra Portable Mac be called? I need names here people - NAMES! Link: MacBook nano in January? "Some MacBook Pro owners have noticed that their battery is swelling and no longer charges properly. Based on reports from Apple's Discussion boards, symptoms include batteries that fail to charge completely, computers shutting down while there is still a significant charge left, erratic trackpad behavior, and mouse button sticking problems." "The MacBook may be one of the finest laptops shipping today. It is thin, light, and just the right size. the screen is clear and bright. It comes with a nice complement of features, with former additional cost options like Airport and Bluetooth built-in. The Intel Core Duo microprocessor makes it a little powerhouse. When using native software the MacBook will give any currently shipping Mac desktop a run for its money. The MacBook offers quite a lot of 'bang for the buck' - at ~$1,200 you get a portable computer with the power of a desktop. I highly recommend it." "For the first time since Apple's PowerBook G3, a Mac comes in black. And oh, how I love black . . . I was super disappointed to hear that the MacBook's casing wasn't shiny black like the nano. [Editor's note: Me too! Glad someone agrees. cm] After the whole iPod nano scratching fiasco, my guess is that Apple didn't want to have to deal with a whole bunch of complaints - and possibly lawsuits - over the scratch-attractiveness of their $1500 laptops. As evidenced by the years of covering iBooks and iPods, the glossy white finish does not show scratches anywhere near as much as the nano and 5G iPod's glossy black finish. I do, however, like the satin finish on the black MacBook more than I thought I would - it even matches the RAZR perfectly - but I have major problems with the greasy-looking finger and palm prints that get left all over it after normal use. I swear, it looks like I eat buckets of chicken wings all day while writing iPod news. "This thing is fast. Hella fast. The fastest computer I've ever really used. Everything from startup time to application launch times to web surfing; the performance of the two processor cores is not just hype. Unfortunately, the processor does make the MacBook literally too hot to place on your lap. (A laptop that you can't use on your lap? Ironic, save that Apple's now calling it a 'notebook,' not a 'laptop.') My MacBook is unbearably hot - it can only be used on a desk. Just doing a little emailing from bed made my comforter feel like it was ready to spontaneously combust." "Apple Computer expanded its line of Intel-based Macs with the new portable MacBook, replacing the popular iBook series. This completes Apple's line of Intel-powered laptops; the MacBook has a lower price point and is aimed at students and other more price-conscious users, and the MacBook Pro targets users with more intensive needs. But don't start thinking that the MacBook is second-rate - it offers a wealth of features and capabilities that should make most prospective buyers salivate. "This new portable uses the Intel Core Duo processor at up to 2.0 GHz, sports a glossy 13.3-inch widescreen display (1280 x 800 pixels), has a built-in iSight camera and microphone, comes with a remote control and MagSafe power adapter, and includes software such as Mac OS X Tiger, iLife '06 and Front Row. AirPort Extreme wireless networking (802.11g) and Bluetooth come standard, as does Gigabit Ethernet (10/100/1000Base-T). A modem is no longer included. Apple offers an external one at an additional cost, but who still uses a modem? "...For many users, the MacBook may be the perfect computer. Imagine hanging out in your dorm room and impressing your friends with the combination of Apple's Front Row software and the MacBook's remote control. You won't have to wade through the debris littering the floor to switch from DVD to iTunes; Front Row's sweet graphical interface will let you navigate with ease. The remote borrows design elements from Apple's iPod Shuffle; there are just enough buttons to do what you want without cluttering up the device." "Apple's entry-level line of consumer laptops should give PC giants like Dell and HP sleepless nights. "The new MacBooks are powerful, fast and sleek machines, at a price to rival similar offerings from the world of Windows. "In addition, they sport Intel chips, so they can run Microsoft's operating system as well as Apple's OS X. "But such versatility comes at a cost. The MacBook can run so hot that it is almost unbearable to have on your lap." "After about 84 hours with Apple Computer's new MacBook, whose high-end version I'm testing, my initial verdict is positive. This is one powerful, affordable Mac portable. "Others may report problems with the Wi-Fi antenna, and such problems might yet surface in my testing, which will last about a month. However, in 'war drives' around my neighborhood, and at home, the Wi-Fi worked quite well. "...the MacBook can be an intoxicating device that will invite you to make the most of it. You will want to run more than one program at a time - you will want to use it to edit video clips, perhaps; certainly for work with digital photos, and even desktop publishing on the fly. I have the feeling this screen will be great for watching DVDs on the road." "For Father's Day, I got a shiny (well, ok flat black) new 13" MacBook, loaded with 2 GB of RAM and a shiny screen (love shiny screens - used them before with an HP). I called this bad boy the BlackBook, and later, the DragonBook, because a single sticker adorns it - that of a torqued up red dragon, surrounded by flames and claws outstretched to kill. "And that's almost where the bad-assness of this thing ends. "There's much to like, but also several issues to complain about." "There is a bit of controversy in MacLand about Apple's incredible mooing lap-top. "It appears that, in some MacBooks, the fan goes on and off continuously in a vain attempt to keep the device from getting too hot. "Some Mac heads have picturesquely described the sound as a cow going, 'Moo,' on the way to he milking shed. The less poetic say it is the sound of a fan on its way out and a computer about to explode." "In this discussion, we will look at experimental source code for programmatically performing the following operations on a MacBook Pro. Retrieving and setting a display's brightness"
"As yet, Apple has not addressed the irritating whine some MacBook Pros emit when running on batteries and the dual-core Core Duo processor clocks back under SpeedStep direction. Turning off one core eliminates the problem, but then what's the point of owning a dual-core machine?" Processor whine - I've heard it on the MBP 15 and it drove me nuts. Thankfully, the 17 has no such whine. "The machine, when plugged into the AC outlet and pushed to the limit, will max out a 2.17 GHz (expected), and it will also max out at 75 degrees Celsius. This is hot. I mean, damn hot. "The top of the machine becomes hot at 70+. Hot enough that you cannot touch the area above the function keys for more than a few seconds. "The bottom of the machine - forget it. You can easily burn yourself if you have this thing sitting on your lap and your clothes are not fire proof." "I've been playing with a new portable I've been anxiously awaiting for a some time. I have really mixed feelings about this machine but I want to carefully think about what I'm going to say. "...Tragically, the MacBook Portable has one of the weakest 802.11 implementations I've ever seen on a mainstream notebook. And this is incredibly annoying. I put the Mac Portable right beside my trusted ThinkPad to test WiFi reception. At 180 feet from my access point, the ThinkPad holds the signal for hour after hour. The MacBook Pro is another story. It has grave difficulty holding its connection and god forbid you should need to connect from afar with poorly charged battery. "But what really annoys me is an AppleDesign decision. The MacBook Pro does not come standard with an internal modem. Hello, Apple, there are still a lot of times when we mortals still connect to the mother ship using dialup. And Apple wants you to buy an optional near $50 USB dongle to connect using a phone network. Grab a clue, Apple and jump into reality! "I need dialup connectivity. Like right now! I'm in a hotel Vegas not far from a public WiFi point that I can't stay attached to and this machine doesn't have a modem. I think this is a detestable design decision and I just can't recommend the MacBook Pro (or any Macintosh portable) that doesn't include this basic connection. Seriously!" "And while I'm on a tear, the MacBook Pro is uncomfortably hot." "Apple's MagSafe power connector for MacBooks is revolutionary (except for a few issues, that is) but true mobile technologists spend a lot of time between wall power outlets and the lack of MagSafe adapters for cars and airplanes is starting to become a liability. Maybe Apple doesn't want us to use our MacBooks and MacBook Pros on the road? "When Apple began shipping the MacBook Pro in February I cut them some slack for not having auto and airplane adapters with MagSafe connectors. But now that the MacBook has been released and you can only buy an Apple notebook with a MagSafe connector I am getting a little concerned about the lack of charging options. Stanford Law Professor Lawrence Lessig started an excellent thread on the Apple Discussion forums about the lack of a good airplane charging solution for the MacBook Pro." Link: Where Are the MagSafe Adapters for Cars and Airplanes? PR: Colored MacBooks are now available from ColorWare, priced from $1,749 to $2,149. The machines are otherwise stock, and ColorWare will also color customer-owned MacBooks. ColorWare additionally offers colored iPods, iBooks and PowerBooks and coloring services to existing Apple customers. PR: designerskins.com announces one of its newest product additions to the skinning world. 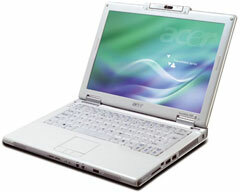 Mobile computing has long been one of the fastest growing markets in the electronics industry. This growing industry has opened up a new avenue to showcase some of our hottest skin designs to date. We were able to take our huge arsenal of original skin designs and manipulate them to create hundreds of new Laptop Skins. "Over the last few years mobile computer makers have needed to be insanely aggressive in dealing with manufacturing costs. For this reason laptop cases are now being manufactured more cheaply and cannot take the abuse needed for the fast paced electronic world we live in. This makes our new laptop skins a triple threat, that of protection, rejuvenation and customization," states Ron DiIorio, CEO and founder of Designerskins.com. Fit most 14"/15", 15.4", and 17" screen laptops. All of Designerskins products are made with a unique heavy duty 10 mil vinyl and feature superior high resolution graphics. They are then finished with a high gloss acrylic coating for incomparable look, feel and protection. PR: Featuring the same designs as our iPod covers for the MacBook & MacBook Pro + PowerBook. PR: The big brother of RoadWired's hottest-selling, award winning Skooba Satchel, the 'Seventeen+' has all of the same sleek styling and innovative details, and more. More space, more pockets, more features (mmmmm . . . more is good). The Seventeen+ is designed to hold any current laptop, including even the largest 'desktop replacement' 17-inch models. The Skooba Seventeen+ has over 20 pockets and compartments, to hold and organize all your digital gear, office supplies, and more. Its computer compartment is lined with Skooba's revolutionary Air Square laptop protection cells, and features a unique, innovative ZipFit system that lets you increase or decrease the size of the laptop section by up to 4 inches to suit your machine. Yet despite its massive capacity, this workhorse - like all Skooba bags - is deceptively slim, sleek and lightweight (if you're carrying a 10 lb. 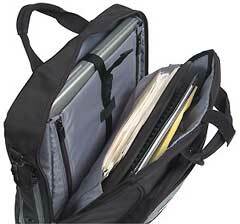 laptop and everything that goes with it, the last thing you want is a bag that adds to the burden). Need a smaller one? 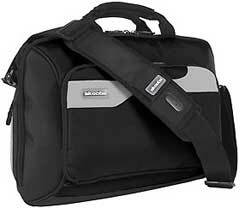 Check out the regular Skooba Satchel which fits medium-sized laptops and even some 17" models. PR: Python XM is not for everyone. If you want large capacity and lots of pockets, a rugged design and solid laptop protection, Python may just be the backpack for you. Booq, a fast-growing, premium brand of performance-driven laptop carrying cases designed to carry the world's most ambitious ideas, announces the introduction of its Python XM Bianco, a rugged, large-capacity backpack designed for the 15" and 17" MacBook Pro and 15" high-performance laptops. Limited to just 250 pieces, each Python XM Bianco sports a pure white ballistic nylon exterior and a walnut brown interior with beige stitching-a reinterpretation of rugged refinement. 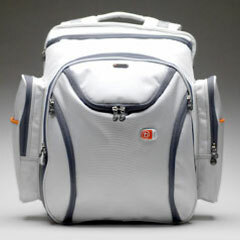 Designed to protect the world's most ambitious ideas, this exclusive bag comes with a tough, rigid-frame laptop compartment, a variety of padded pockets and compartments for items large and small, a dedicated iPod pocket with non-scratch lining as well as many more intelligent detail solutions. Unlike any other bag before it, Python XM Bianco embodies the unique exclusivity of the company's premium line of professional laptop bags. Priced at $189.95, trendsetting creative professionals will know that owning a Python XM Bianco is an aspiration worthy of turning into reality. Creative professionals who have come to expect fresh and innovative design solutions love the exceptional level of quality and functionality of Booq's products. The privately held company is based in Sierra Madre, California. In terms of utility, Python is one of finest laptop backpacks available: Weather-resistant ballistic nylon exterior and tough, seatbelt nylon straps, a rigid-frame laptop compartment designed to protect the world's largest laptops, lots of padded pockets and compartments for items large and small, a dedicated iPod pocket with non-scratch lining, removable waist strap, sternum strap, and much more. In terms of capacity, Python is hard to beat: You'll have room for a stack of books 5" high, a complete set of clothes with shoes, or large document folders and shipping envelopes, water bottles, camera, plus your complete set of typical laptop accessories like cables, mouse, power adapter and more. Python even has a secure iPod pocket completely lined with non-scratch fabrics, protected by two layers of zippers. Again, Python XM is not for everyone, but if you are looking for the most rugged, most versatile backpack that can hold your laptop and everything you need, this backpack's for you. High-end materials and hardware, rugged construction. 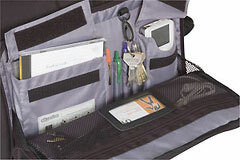 Various padded accessory pockets for items large and small. Rigid-frame laptop compartment with 0.75" hd foam padding and non-scratch lining. Room for a stack of books 6" high, water bottles, camera etc. Ergonomic, breathable shoulder strap design with sternum strap and waist belt. Dedicated and secure iPod pocket, accessible from the interior only. Exterior Dimensions: 17.0" x 16.5" x 8.0"
Laptop Compartment: 14.2 x 11.25 x 1.6"
Moving your Mac laptops, closing lid, or disconnecting power cord will trigger the alarm. Send mobile text message when alarm is triggered. Option to lock screen while JackSMS on or alarm is triggered. Adjustable sudden motion sensor (SMS) sensitivity and alarm duration. Designed to work on iBook, PowerBook, MacBook, or MacBook Pro with built-in SMS. AppleScript support to work with Salling Clicker or BluePhoneElite. Growl support for JackSMS status notification. Lock screen now independent of your screensaver/sleep security setting. Fix a bug that alarm will be triggered when battery is getting charged. Option to temporarily disable idle sleep while JackSMS on. Improved handy feature to lock/unlock your computer while away/back (Salling Clicker or BluePhoneElite needed). Absolutely no user intervention is needed. Apple has restricted the use of monitoring applications on Intel-based Macintosh systems. Thermal management of those computers is no longer done by the operating system, but controlled by an undocumented hardware device, the Apple System Management Controller. Only a few sensors are accessible by application programs. Due to quality problems and intellectual property issues, support for the third-party software "SpeedIt" has been removed. The application now comes with its dedicated own driver to access internal information of x86 processors. The driver can easily be installed or uninstalled from within the application. The program will automatically notify the user if installation of the driver is recommended. The following additional sensors will be accessible on current x86-based Macintosh systems when the driver is active: the internal digital thermal sensors for each CPU core of Intel processors. In addition, the System Information window of the application will be capable of displaying family, model and stepping numbers, as well as the internal identification of x86 processors after the aforementioned driver has been installed. Added new preference values to adjust the ratio of the font sizes for display of the sensor labels in relation to display of the sensor readings. The preference settings are available for the sensor window and the screen display output channels. The policy for detecting temperature sensors that are built into hard drives has changed: If the application detects a SATA drive under control of an Intel-based Macintosh system using AHCI, it will automatically assume that this drive contains a working temperature sensor compliant with the latest version of the ATA and S.M.A.R.T. standards. Up-to-date hard drives will no longer need explicit support by the application but will be accepted automatically. The column for temperature sensor support in the Drive Overview window has been removed. The reference manual now gives an example on how to define a sensor alert trigger to automatically shutdown the system when readings exceed adjustable threshold values. Educators from the U.S. and abroad will be among the first to test-drive prototype models of Nicholas Negroponte's much-discussed $100 laptop during the National Educational Computing Conference (NECC) July 5 through 7, in San Diego. NECC is presented by the International Society for Technology in Education (ISTE). "ISTE's NECC will be the first public forum at which we not only show a working prototype of the $100 Laptop, but also provide hands-on access to developer machines," Negroponte said. "Furthermore, selected conference attendees will be invited to participate in our developer program." Thanks to Negroponte's One Laptop Per Child Initiative (OLPC), journalists and NECC attendees can try out the $100 laptop's casings and motherboard. OLPC staff will be available to answer questions. Negroponte, cofounder and chairman emeritus of MIT's Media Lab, is one of the most influential thinkers and doers of our time. He is also NECC's keynote speaker, and will be discussing the latest about the $100 laptop project. The goal of OLPC is to revolutionize education by putting a compact, durable, no frills, but Internet-ready computer into the hands of millions of children worldwide. Negroponte is a founder of Wired magazine and author of the best-selling book "Being Digital." NECC draws 15,000+ teachers, teacher educators, technology coordinators, library media specialists, administrators, policy makers, and exhibitors from around the globe. The exhibit hall includes more than 500 of the industry's most influential companies and service providers - many of whom announce new products at the conference. In addition, NECC offers dynamic speakers, practical demonstrations, panel discussions, workshops, Internet poster sessions, research papers, a Global Gallery, and a fun and inspiring Student Showcase. NECC is the largest and most comprehensive event of its kind in the world. NECC is presented by ISTE in cooperation with the California Computer-Using Educators with additional support from the San Diego County Office for Education. "Sony will replace hard disks with flash memory when it launches a new model of its Vaio U laptop next week, it has announced. "The computer will be one of the first on the market that uses flash memory in place of magnetic storage. "Flash has long been eyed as a potential replacement for hard-disk drives because it's lighter, runs silently, offers faster data access and uses less power, but price has always been an obstacle...."
"In late May, Dell started selling a computer complete with an eight-speaker surround-sound package, a Bluetooth keyboard, and a 20.1-inch monitor - an impressive host of extras for any desktop system. Thing is, the XPS 2010 is a notebook, a machine that can be closed shut and carried - monitor, speakers, detachable keyboard, and all - from one place to another. "More than ever, computer makers are blurring the lines between desktops and notebooks, making the latter an attractive alternative to a hulking PC. The increasing appeal of notebooks is showing up in analysts' forecasts: Gartner predicts an increase of only 1.9% in global desktop sales for this year, compared with an estimated 31.4% gain in notebooks." "If you're an executive at Asustek Computer, the answer is easy - go for glitz. The Taiwanese company, a leading producer of finished PCs as well as important but unexciting computer components like motherboards, has teamed up with Italian sports car maker Automobili Lamborghini to sell a line of notebook computers with design touches that evoke the legendary brand. "Launched early this month and displayed at last week's Computex trade show in Taipei, the new Lamborghini laptops are shiny black or gold, with the Italian carmaker's logo on the exterior." Link: A Lamborghini on Every Desk? "Acer has unveiled its first all-white notebook, the MacBook-like TravelMate 3020. According to the company, the colour scheme conveys "images of pureness, cleanliness and maximum lightness". Apparently." "Dell says it's investigating an incident in which one of its laptops is said to have caught fire. "The event, detailed in a report by the Inquirer.net, saw the Dell laptop produce smoke and then catch fire during a business conference in Japan."